TSV works with a lot of venues throughout the country and we definitely have our favorites. Today we are going to talk about our top five venues to work with in the Austin area, from a production standpoint! 1. Brazos Hall is located downtown and was converted from an early 1900’s grain mill. You can feel the history in the brick walls and it makes for a very aesthetically pleasing venue. The room features a balcony that looks onto downtown and is easily convertible for various events. Hang bars have been installed for great stage lighting capabilities and our team can supply lighting support structures if necessary. This venue has 200 amp power capabilities for large or small jobs. Having sufficient power is important if you’re wanting to do more with your event. The more power, the bigger and brighter your projectors can be. This means they will create more of a visual impact! Larger sound systems also become a possibility with more power and become necessary if the event is bigger. 2. 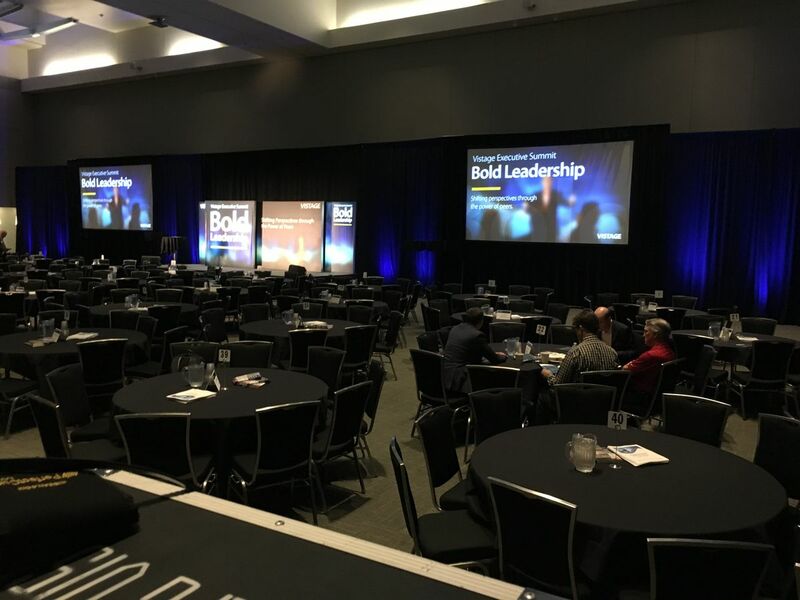 Austin Convention Center tends to host expos and trade shows since they have the largest floor space, the highest capacity for attendance in Austin and multiple breakout room capabilities. When it comes to the Convention Center, nothing is too big due to the tall ceilings on the tradeshow floor and great power. 3. JW Marriott is located in the center of downtown and accommodates a high percentage of corporate events. High-end clients love this hotel because of the variety of breakout rooms and accommodations. This venue also has the capabilities for rigging and a surplus of power. Once again, you can have bigger and brighter projectors or LED walls with this kind of power. The larger the LED wall, the more power it draws and the bigger impact it will have on your guests or audience. 4. If you love the JW Marriott, but find the venue out of your price point, the Hilton Downtown has a similar upscale appearance. The Hilton has a lot of breakout rooms, multiple floors for ballrooms and the capabilities for rigging and separation of the rooms to entertain any size function. The capabilities and size of this venue make for easy production! 5. Hyatt Regency Austin dedicates a large portion of the facility to just events due to its unique layout. The hotel itself has a number of simplistic ballrooms with breakouts ready for your creative touch and an added skybridge in that area called the Zilker Ballrooms. The in house vendor has limited capabilities and for this reason we work with the team there on a regular basis! We may have our favorites, regardless TSV is willing and able to work with any venue in the Austin area to produce a seamless event! Contact us today if you have any questions!